London is one of Canada’s leading social finance communities, where collaboration and innovation has already created more than $7 million in additional capital towards an inclusive economy. 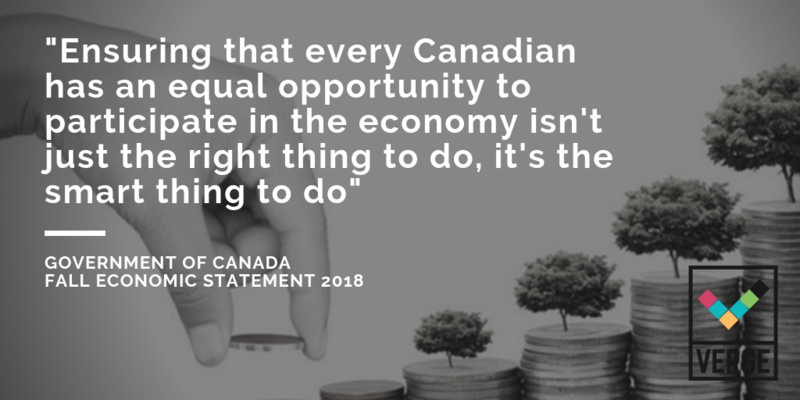 On November 21st, Canada’s Finance Minister Bill Morneau announced a $755 million fund for social finance. An additional $50 million will be made available through an Investment and Readiness stream over the next 2 years. Social finance is the practice of making investments that deliver social and environmental returns, as well as financial. This is BIG news for London and Southwestern Ontario where VERGE Capital and its local collaborators, London Community Foundation (LCF), The Sisters of St. Joseph and Libro Credit Union, are rallying impact investors, redirecting investment dollars back into our community and supporting important community ventures such as affordable housing developments, community hubs and social enterprises that are solving some of our community's biggest social and environmental challenges. Pillar Nonprofit Network has helped hundreds of social enterprises scale and grow since 2011. Access to capital is a well-researched barrier to success for social entrepreneurs. The VERGE loan programs enable social enterprises across Southwestern Ontario to obtain needed financing at both the starting and scaling phases of business growth. VERGE was only possible through initial support by the Ontario Government. Now, Federal Government support will catalyze even more dollars to help grow impact investing and the resulting capital it will mean for social enterprises. In addition to the VERGE loans, the collaborators for VERGE have in tandem been adding to the region’s capital for an inclusive economy through their own impact investing plans. VERGE is a member of the pan-Canadian National Impact Investment Practitioners (NIIPS) Table. We join social finance funds across the country in our recognition of this “big step forward for social finance&quot; We believe this will strengthen an ecosystem of intermediaries and entrepreneurs who are developing new business models to create jobs and serve communities which generate positive social outcomes. Driving these resources into capable hands will result in building more affordable housing, reducing our carbon footprint, employing vulnerable people and creating an economy that works for everyone. While the new federal fund structure is still yet to be worked out, it is expected that both new and existing funds will be able access this new capital. One thing is for sure: the social finance movement just reached a huge milestone. VERGE and other social finance funds across the country will be waiting for more details about the Social Finance Fund, expected in early 2019. VERGE Capital is a social finance program of Pillar Nonprofit Network in collaboration with Libro Credit Union, London Community Foundation, MaRS Centre for Impact Investing, Sisters of St. Joseph and the Government of Ontario. VERGE operates two social finance funds that make loans to both new and established organizations across Southwestern Ontario. Twenty investors ranging from religious congregations to foundations to individuals, have pooled their dollars to create the VERGE Breakthrough Fund Unit Trust. For more information visit www.vergecapital.ca.